I don't know about you, but here in my household, we have yet to officially kick off Summer. We are in the last week of school (YAY!) and then I can say "Let Summer begin!" In the meantime, the DT of Your Next Stamp have created some super fun and super summer-y projects to help you kick off Summer! 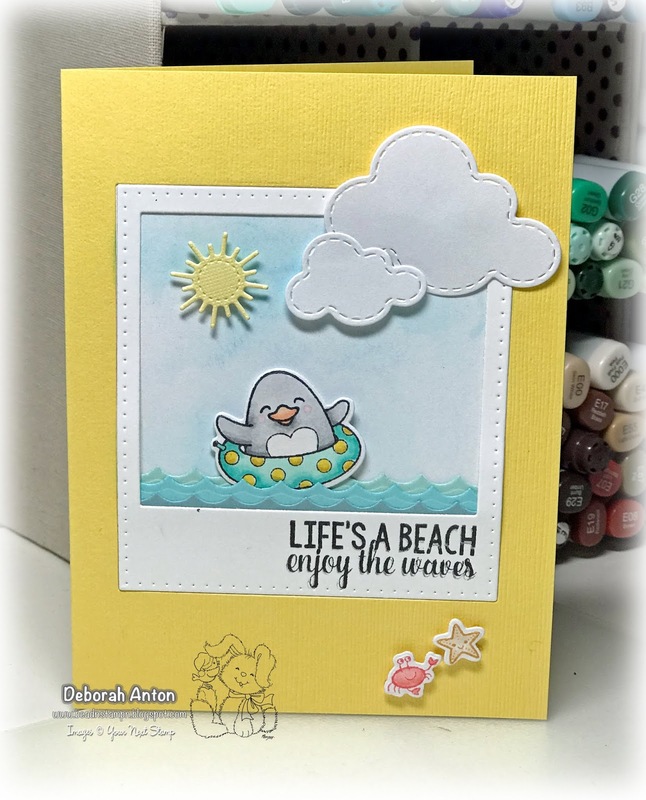 For my card, I pulled out the Waddles Beach Fun set to create this cute frame card. Waddles was colored in with Copics and the waves were made using the Tiny Waves die set. The frame used is the InstLove Polaroid die while I sponged in a little sky before completing the card with some clouds and the sun. I couldn't resist adding in the cute crab and starfish to make it a little more beach-y. Be sure to head to the YNS blog to see all the fabulous creations. Leave a little love and you can have a chance to win a stamp set of your choice! Who doesn't love that? Thanks for stopping in and taking a peek! Have a great Wednesday!